4. What is DevOps all about? For NSX, I attended an excellent session titled “An Introduction to Network Virtualization” (NET5516) with Eric Lopez and Thomas Kraus (@tkrausjr) from VMware, both formerly of Nicira. Following are some notes I took down from their slides. The network drawing depicts a 3-tier web application which includes web, application, and database servers. Each server tier is on a different subnet, and thus connected to a different port group. The NSX Edge shown acts as the external layer 3 (L3) gateway for each subnet shown in blue, green, and orange. At the beginning of this lab section we verify the web app is working properly by connecting to the website and verifying data is served from the back 2 tiers (application and database servers). Then we disconnect the NSX Edge from the App and DB subnets/port groups and validate that the website is broken (can get to web servers but get an HTTP error saying service not working). 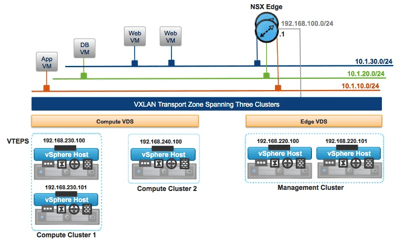 Next, we connect to the vCenter web client and verify that each cluster is configured and loaded with the virtual router and virtual firewall components of the NSX suite, and we configure the router and firewall to connect to the App and DB tiers and allow the appropriate traffic. Finally we verify that service is restored on the website. Part of the configuration includes OSPF connectivity between the virtual distributed router on the ESXi hosts and OSFP running in the NSX Edge routing engine. Looking at the snapshot below of the NSX Edge you can see the similarities with Cisco IOS. 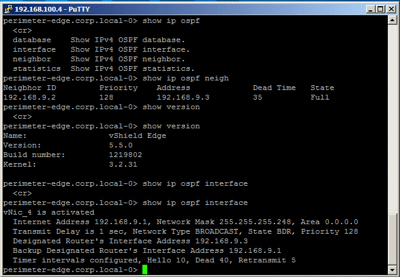 For instance, “show ip ospf neighbor” and “show ip route” commands are identical. I hope to complete this lab tomorrow. While spending some time in the Solutions Exchange I discussed what DevOps means with someone involved in that space at the Cisco booth. As I understand it, companies usually first get virtualized, then they implement a service catalog, then they implement a “cloud” such that it’s self-service enabled. DevOps refers to IT working closely with developers such that they create the development environment as well as production environment that the developers will deploy to. If you know more about DevOps and I’ve misunderstood, please keep me honest. Finally, in the VMware booth I learned about the VMware IT Business Management Suite. It enables companies to understand costs and, as I understand it, implement chargeback to IT’s internal customers. The demo looked pretty impressive, and I think there is a lot of value in such a tool. It can pull General Ledger data directly from standard systems such as Oracle and SAP and presents data in a well-thought-out manner. It’s something to share with the CIO and/or accounting folks back home. Started out a productive day with my first-ever Fritatta and some delicious croissants at breakfast in Moscone South. Having seen the debacle of “breakfast” at last year’s VMworld, the seating this year was at least an improvement with areas available in both Moscone South and West. My first session was “Moving Enterprise Application Dev/Test to VMware’s internal Private Cloud — Operations Transformation (OPT5194).” This was a great story of how leadership from the top pushed VMware to implement Infrastructure as a Service (IaaS). Kurt Milne (@kurtmilne) (VMware Director of CloudOps) and Venkat Gopalakrishnan (VMware Director of IT) shared lessons learned during VMware’s internal implementation of a service catalog and the automation of processes which used to require manual intervention by cross-functional teams over the course of weeks. The process of standing up a new Software Development Life Cycle (SDLC) series of dev/test/uat/stage/prod environments has been greatly automated and provisioning time reduced from 4 weeks to 36 hours and they plan to reduce it to 24 hours in the near future. If you’re going through a similar journey in your organization, this session is a must see when recordings and slides are released after the conference. I believe the session was also live-tweeted by @vmwarecloudops. vSphere is now wrapped up with Operations Management, i.e., vCenter Operations Manager (vCOPS). Referred to as “vSphere with Operations Management” it’s now available in the Standard, Enterprise, and Enterprise+ flavors, each of which includes vCOPS Standard. See snapshot of feature breakout and license cost. vCloud Suite variations all include vSphere Enterprise+, vCloud Director (vCD), and vCloud Networking and Security (vCNS). The individual flavors depend on the version of vCOPS and vCloud Automation Center (vCAC) which are Standard, Advanced, and Enterprise. In addition, the Enterprise SKU also includes vCenter Site Recovery Manager (vC SRM). vSphere Web Client is replacing vSphere Windows Client, so we “better get comfortable with it.” If I understand correctly, vSphere 5.5 includes support for all functionality in the Web Client now but not the Windows Client. New features in vSphere 5.5 include: VMDK file support up to 62TB, 4TB memory per host, 4096 vCPUs per host. vSphere Replication allows full copying of workloads, including the VMFS files, without shared storage. This perhaps saves the cost of more expensive synchronous or asynchronous storage replication, but has a somewhat limited Recovery Point Objective (RPO) of about 15 minutes. Still, this may be a good fit for some organizations for DR (including mine). In addition to the sessions I was able to complete three labs (between yesterday and today) all related to VMware’s recently announced vCloud Hybrid Service (vCHS). HOL-HBD-1301, HOL-HBD-1302, and HOL-HBD-1303 give a good introduction to the components and steps necessary to migrate workloads from a vSphere or vCloud Director environment in your own datacenter to the vCHS environment, as well as networking & security components and managing the service. One big announcement during the morning General Session/Keynote was the release of VMware’s network virtualization product called NSX. This is the marriage of Nicira (an earlier VMware acquisition) and vCNS/vShield in a new product. As a network engineer by background and training, this is particularly interesting to me. I was able to start the NSX lab (HOL-SDC-1303) but couldn’t yet finish as I ran out of time. I plan to finish tomorrow. More to come on that. I have to give a big thumbs-down to VMworld’s requirement that we all get our badges scanned as we enter lunch. I don’t remember this last year, nor have I ever seen this at any other conference I’ve attended. What gives? It’s hard to hold a herd of hungry humans back from the food! I’m failing to mention all the great people I met and conversations but one would expect nothing less from a great conference!